While the commercial launch of Reliance Jio brought affordable broadband internet to millions of Indians, cellular data speeds in the country continue to remain abysmally low, as was suggested by a report from OpenSignal late last month. Now, the UK-based company has come out with its latest report about the state of mobile networks in India, which seems to show that residents of one town in Maharashtra are enjoying significantly better internet speeds than their counterparts elsewhere in the country, even though, it’s still on the lower side compared to global standards. The report, published on the basis of a study conducted between December 2017 and February 2018, claims that Navi Mumbai has the fastest 4G download speeds in the country, with an average of 8.72 Mbps. Incidentally, the Reliance Jio headquarters is located in Navi Mumbai at the Dhirubhai Ambani Knowledge City. 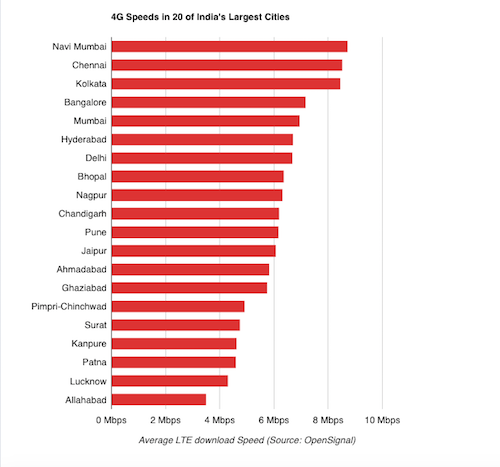 The OpenSignal study tracked average 4G download speeds among 20 of India’s largest cities, and ranked Chennai and Kolkata at numbers two and three, with speeds of 8.52 Mbps and 8.46 Mbps respectively. It’s worth repeating here that the report only takes into account the 20 largest cities in the country, and not every single town where 4G is available. However, the advent of Jio has helped spread the technology to even the remotest corners of India, covering around 90% of the country’s population, if the assertions of Jio Chairman Mukesh Ambani are anything to go by. The carrier, however, has thus far failed to hit the 99% target it set for itself while rolling out its commercial services a couple of years ago. It will be interesting to see how the impending roll-out of 5G will affect things going forward, but with India not expected to get the technology any time soon, wireless broadband speeds in the country will probably continue to languish much below that of the global average in the foreseeable future.